Baked Bang Bang Tofu, simple enough for a weeknight dinner or a special meal! Serve over rice, cauliflower rice or stir fry or simply on its own as an appetizer. 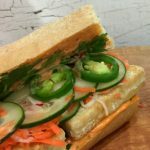 A million moons ago, back in the dark ages of blogging (that means five years ago), I shared a recipe for Bang Bang Tofu cooked on the stovetop. While I still enjoy that method, I like the baked recipe I’m sharing today even better. 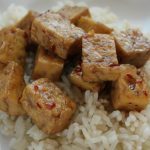 The sauce caramelizes onto the tofu and the tofu gets a nice browning when cooked in the oven. It’s actually less hands-on cooking time than the stovetop method, even though there is slightly more cooking time that is inactive. 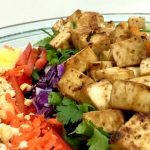 TOFU: I use the high protein tofu that can be found at Trader Joe’s (store brand) or at supermarkets from the Wildwood brand. 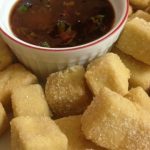 This variety of tofu is super firm and requires much less draining and pressing than other versions of tofu. Simply open the vacuum pack, drain the tiny bit of liquid and it’s ready to go! I like this for days when I’m limited on time, which seems to be most days. I cut the block into seven slices horizontally and then cut each slice into 12 cubes. It takes no time at all to do this. MAYO: I use Hampton Creek’s Just Mayo. It’s by far my favorite egg-free mayonnaise. It’s also my favorite to use in potato salad and deviled eggs. SOY SAUCE: I keep a multitude of gluten-free soy sauce options in my kitchen, everything from Tamari, Bragg’s Aminos and Coconut Aminos. It used to be that coconut aminos were only found in specialty food stores, but I am finding it everywhere now from my local super market to Trader Joe’s. For those avoiding soy, this is a good option. Alright, let’s jump into the recipe now. 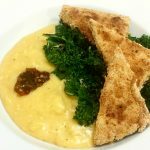 I’ve made myself hungry just writing this post. I hope you enjoy this dish as much as we do! 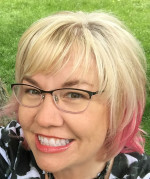 Oh, hey, one last thing! If you are a fan of tofu OR if you are hesitant because you’ve tried before and it wasn’t edible, I’m here to help. 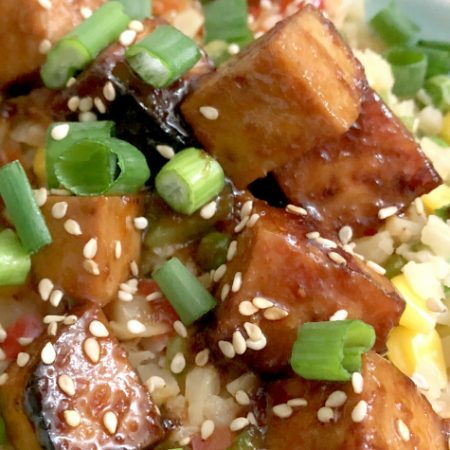 I’ll leave links to a few of my favorite recipes with tofu below. 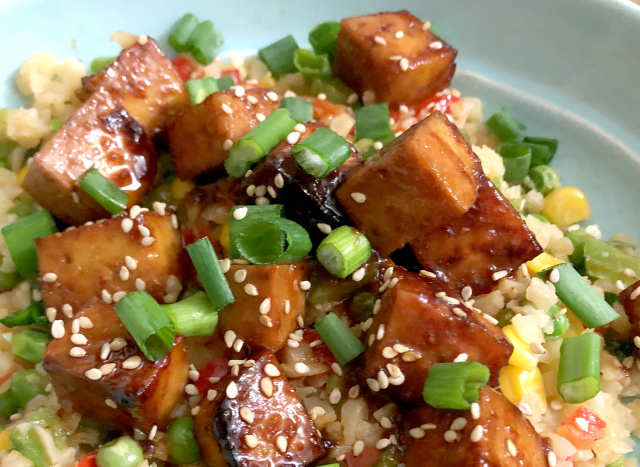 Tofu is simply a flavor sponge, so if you follow a tried and true recipe, you’ll have tasty results! Cube the tofu and set aside. In a 9 x 13 baking dish, mix together all ingredients except sesame seeds and green onions. I use a fork to "whisk" the ingredients together into a sauce. Add tofu to the sauce and toss to coat tofu. Bake at 400 degrees for 15 minutes, then stir. Bake another 10-15 minutes until tofu has reached the level of browning you prefer. Remove from oven and place on serving dish. Sprinkle sesame seeds and green onions over the top. 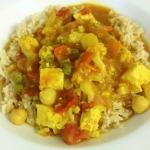 This is terrific served over rice, cauliflower rice or with stir fry. It is also a great appetizer on its own.